I'm very sorry to have to tell you that the wonderful singer-songwriter Lesley Duncan (Sing Children Sing, Earth Mother, "Love Song" etc) died yesterday afternoon after a long illness. She was only 66. A Tributes page will be opened on the site www.lesleyduncan.net. That's too bad. And Alan Parsons knew how to pick his guest vocalists: Lesley, Colin Blunstone, Allan Clarke, and more. Lesley Duncan's "If I could change your mind" is magnificent. I still have an obscure but rather lovely album featuring Lesley Duncan; I must dig it out. She was a great vocalist - and demonstrated later that she was a very talented actress. Truly sorry to hear the news. Lesley RIP. Her duet "Love Song" with Elton John on one of his first albums was one of my favourites from that era, and I can never listen to it without being reminded of a certain young lady I used to sing it with. There is an obituary of Lesley Duncan in The Times today (Monday March 29). I was surprised to learn from the obit that it wasn't in fact a duet on the Tumbleweed Conection version, it was Elton John multi-tracking himself. She was a great vocalist - and demonstrated later that she was a very talented actress. Are you thinking of Lindsay Duncan the actress? I don't think Lesley was one, at least there's no mention in her obit. Before her success as a songwriter and solo artist, or even as a backing singer, Lesley did in fact appear in a film. 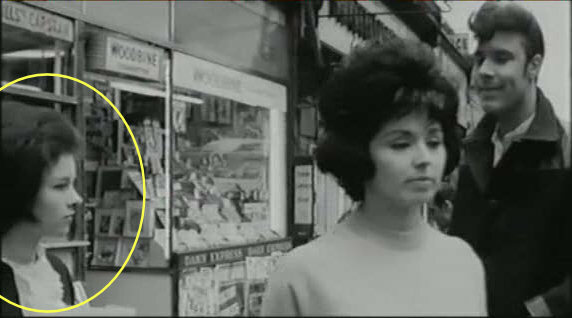 1963's 'What a Crazy World' was Elstree's attempt at a teen beat movie set in pre-swinging London. A Joe Brown vehicle, it also featured Susan Maughan, Marty Wilde and Freddie and the Dreamers! It was notable for being shot largely on location in and around the Whitecross Street Market, in sight of St Luke's church. Soon afterwards, some of the locations disappeared beneath the Barbican development. Lesley plays Lil, Susan Maughan's quiet friend. By my reckoning she has four lines. But hey, she was an actress! Alan Klein wrote the screenplay and the music. ....not to be confused, as he sometimes is, with the former Beatles manager Allen Klein.